If you have been reading Fewd Snobs and paying attention at all, you already know that we love pizza. And we love frozen pizza. And we love Tombstone pizzas. Did we say the word “pizza” enough, yet? 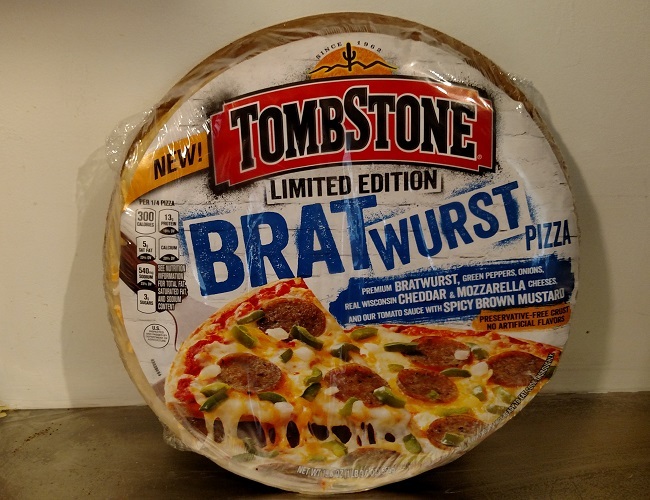 So when Denny came across the new Tombstone bratwurst pizza, our mission was clear. Pizza and brats! Fewd Snob Heaven! Tombstone is pushing these on its Facebook page as being “bold.” Bold is the keyword, although it isn’t listed on the package. Whatever. 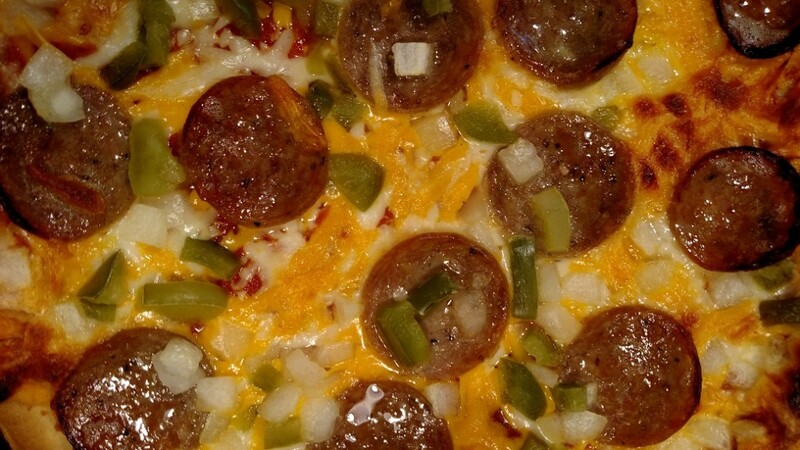 There are two new flavors, but since pizza and brats sounded good to us, we are only looking at this one. 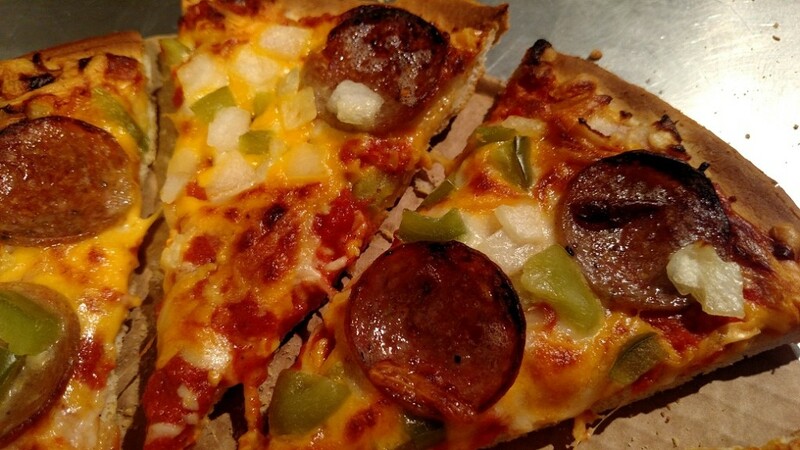 The package describes the bratwurst pizza as, “Premium bratwurst, green peppers, onions, real Wisconsin cheddar & mozzarella cheeses, and our tomato sauce with spicy brown mustard.” Now, we think that everybody would agree that a pizza with mustard and brats on it sounds interesting to say the least! We need to talk about the cooking first. The package says to cook the pizza on 400 degrees for up to 19 minutes, or until the edges are golden and the cheese is melted. 19 minutes wasn’t even close. It needed a LOT longer than that. We were up to 25 or 26 minutes, and it STILL wasn’t done. We threw the broiler on to finish it. And even with the broiler on, we had to wait about 7 minutes before it was actually done. So beware. You will need longer than the package says to cook it. We were getting impatient because it looked good, and we were ready to dig in. Fewd Snobs don’t like waiting! Our beer was getting warm! We have actually sampled the pizza twice. One time was when we were completely wasted, and the other was just before writing this review! So if you notice a difference in the pictures, it is because we have shots of both pies. What you will notice right away is that the slices of brats look like pepperoni slices. This is especially true if you cook the pizza until it is nice and golden, which is how we prefer it. In the pic below, you can see the brat slices look more like brats. Our second test pizza wasn’t cooked as dark. We think that the pizza tastes better when it is darker, though. There is plenty of cheese on the pizza, and it is definitely a mix of cheddar and mozzarella. There are plenty of green peppers and onions, too. To put it bluntly, the pizza looks damn good. Let’s start with the brats. The simple fact is that the brats do not have an overwhelming flavor. They aren’t that strong. And that stands to reason, because the slices are very thin. And brat slices aren’t going to have as strong of a flavor like pepperoni does. But that said, you can tell they are brat slices, and the flavor is good. We gotta talk about the mustard next. Mustard on a pizza. Who would think this is good? You ready? It is good! There is mustard flavor with every bite. All Fewd Snobs know that the only way to eat a brat is with mustard. Tombstone obviously knows this, too. And Tombstone nailed it. The part we can’t figure out is where the mustard is! We can’t actually see it. It MUST be mixed in with the tomato sauce. The funny thing is, there is no yellow color to the sauce. It still looks red like regular tomato sauce, yet the flavor is definitely there. There is some kind of hocus pocus going on here. And we like it. 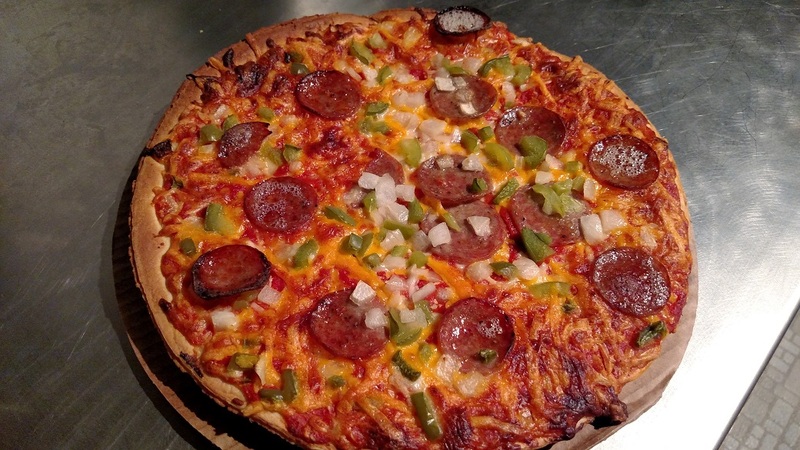 As we said earlier, there are plenty of onions and green peppers on the pizza. They add a nice strong flavor to the pie. And a little crunch. Onions can certainly be found on brats, but not really green peppers. The green peppers would be found on a pizza, though. This is a pizza after all! We think Tombstone was going for the sausage, onions, and peppers sandwich type effect. On a pizza. Confused yet? Doesn’t matter. All of it mixed together gives a nice, full-flavor. The combination is dead on. This is the main point of the whole thing. Everything together is excellent. Nothing is overpowering. The bratwurst is subtle, but it is there. We can’t stress enough that everything together is perfect. This is a damn good pizza. That pretty much sums it up. We highly recommend this pizza. Tombstone has done it again. Tombstone already makes our favorite frozen pizza (the Supreme). If Tombstone is going to keep making pizzas like this, we can’t wait to see what is next.